Labradors are dogs that quickly grow up and this should be taken into account when you decide to choose them. These dogs are extremely charismatic and patient, but they need contact with the owner. Labradors are very active and busy, so you need to provide them a daily dose of movement connected with a play with the participation of the owner, fetching or swimming. The price of puppies is not clearly defined. It is influenced by many factors. 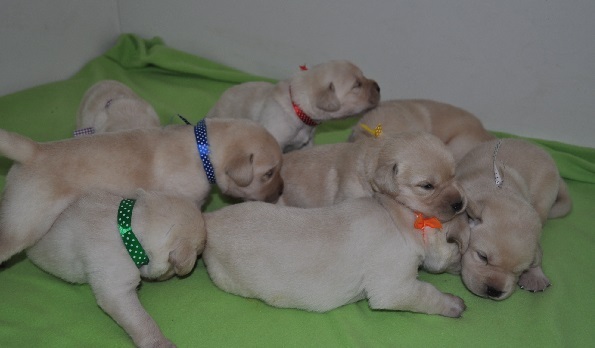 More information about the prices of puppies is presented in the later part – we invite you to read it. In our website you can find answers to many questions about both this breed and puppies. Can a Labrador puppy stay at home alone? Yes, of course. It would be strange if you would take your puppy with you everywhere. When the dog is at home alone in the absence of the owners, you must ensure it an access to water and toys – otherwise it will be bored and it can destroy some things in your house. Thanks to these toys, the Labrador puppy will be able to take care of itself when it is left alone. However, remember that Labrador and Labradors puppies loves water and water reservoirs, so you can successfully take them with you if it is possible. How much does the Labrador cost? Labrador price? There is no clear answer, because the price of Labrador depends on many factors. These factors include, among others, the origin of parents, cost of insemination of the female, tests of parents, titles of parents and litter size. 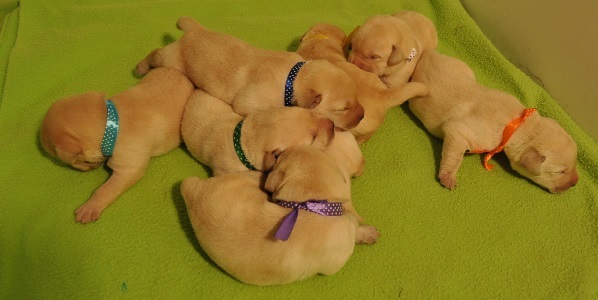 Price for a puppy from each litter is individually determined. In our breeding, we place a great emphasis on the tests of parents of future puppies, because we want to ensure that the puppy, which will be purchased by you from our breeding, is free of any hereditary diseases. Please remember that the dog must be a member of your family for many years, and it should not be a regular patient in the veterinary clinic. Labrador is a magnificent companion of life. Therefore, its price does not reflect the love that it is able to give you. How long does the Labrador live? An average life expectancy of the Labrador is 12-13 years. Of course, there are exceptions from this average. Much depends on environmental factors, in which a dog is raised. Therefore, it is important to provide it a well-balanced food and appropriate care. Yes. All puppies is our breeding are socialized so they do not demonstrate any fear in relation to people and animals, they do not afraid of household appliances and driving. It is worth saying that the puppies socialize very well up to 12-15 weeks of age. They practically absorb each situation, in which they will find themselves in this period and they fully remember it unit the end of their life. 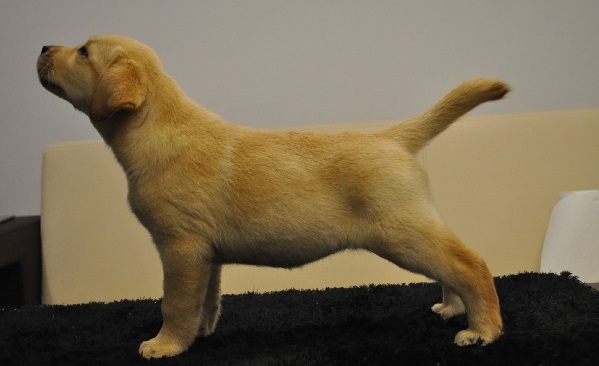 Therefore, the age up to 15 week is such an important stage in the Labrador’s life. When can the puppy leave the breeding and go to a new family? The optimum time to leave the kennel is 8-9 week of life. The exception includes only situations when the puppy goes abroad. Then the reception is determined individually, because some principles related to the exportation of a dog from the country must be complied. All puppies born in our kennel have the early puppy socialization. This socialization has a positive impact on their later development and contact with people and other animals. Socialization, generally speaking, is a process to prepare a puppy to live in the world of people and animals. The proper process of socialization is influenced by both the breeder and the future owner of the puppy. Omissions in the process of socialization are very difficult to fix, so it is so important. Although the upbringing of the Labrador is relatively easy, it should be realized from the beginning, because the dog ought to gain correct patterns. A well-behaved dog is a joy for the owners and for itself, because it translates into years of amazing friendship. Moreover, you can go with a well-behaved dog to unusual escapades out of the city and sped time together in a very interesting and developing way. 1-2 weeks of age – Puppies become familiar with a touch not only their mother, but also with the human touch and the warmth of his body. During this period, they are stroked and picked up by family members, so they meet the human by touch and smell. At that time, only two senses of the puppy are active, because it is still deaf and blind. 3-4 weeks of age – Puppies Begin to open their eyes, see and recognize shapes and colors even though their eyes are covered with a membrane, which protects their eyeballs. During this period, we start the stimulation of the puppy’s vision by placing different colorful toys and objects in the bed. Furthermore, we do not forget about further stimulation by touch. At that time, puppies connect the sense of touch (known previously) with the sense of sight. They see the person, who stroked/ touched them. The puppies also begin to hear sound stimuli, they get accustomed to the voice of people and sounds emitted by household devices (music, household appliances, etc.). 5-6 weeks of age – Puppies are independent in a large extent, but they still need the presence of a mother. During this period, they build self-confidence, learn when playing in the herd that the bite hurts so that they learn to control the pressure of jaws during plays while playing with each other. 5-6 weeks of age is a time of an immunity gap and decrease of the puppy’s immunity. The mother limits the feeding of puppies and it starts to bark at them, because they cause pain – they already have teeth and claws. At this time, they have protective vaccination and we introduce dog food. In this age, the puppies should be intensively socialized. In our breeding, they are taken outside to explore the world by walking on different surfaces (concrete, grass, sand, puddle, leaves, etc. ), so that they acquire confidence in the free walking regardless of the place. Still remember about the fixation of sound stimuli and establishing ties with the man. Six weeks old puppies know how to play with the man, and properly socialized puppies even stick to the man without any fear. 7-8 weeks of age – Usually, this is the last period of a puppy in the kennel. During this time, the puppy is independent – it can eat food and drink water. This is also the perfect time for a puppy to socialize with other animals. We begin this socialization in 7 week of age from the release of puppies on a walking field with adult dogs (so far the only adult dog, which they knew, was their mother). On the walking field, the puppies learn behaviors from adult dogs – they learn the hierarchy in the herd. They also acquire qualities, which will be observed in later life. They learn about the customs and closeness of other dogs, learn the characteristic communication in their genre (licking, tail wagging, paw flicking). Keep in mind that the puppy needs the contact with representatives of its species at different ages for proper development. Therefore, you should enable your dog such a contact as long as possible. In the 8th week of age, we socialize the puppies with other animals – of course, in a safe distance. Due to the fact that we live in the village, our puppies can see farm animals (horse, cow, hen, duck, etc.). This is a very important stage in their life, because they learn that there are also other animals. It is also a time when we take the puppies on drives and walks into the forest and to the river. Moreover, we learn them to walk on uneven ground, jump into tree trunks and wall, etc., so that the puppies learn to balance not only on even surfaces. Usually, this is also the last time when we are with the puppies. After 8 weeks, they leave us and go to their new home. From this moment, the new owners are responsible for their process of socialization. The new family must remember that the puppy learns the most intensively up to 4 months of age and all information passed during this time remains for its entire life. Of course, we provide any advices and offer our knowledge for the new owners throughout the next life of the puppy. We are very happy when we receive photos from the owners and see how a “small ball” becomes a beautiful dog.